One of the worst feelings in the world is going to take a nice hot shower and discovering that you have no hot water. No hot water can be especially disheartening during the cold winter months. Luckily there is a way to prevent this issue from ever happening. Installing a hot water circulation pump will ensure that you will have hot water all year long. The way a hot water circulation pump works is simple. The pump ensures that the water in your home never gets cold by having a small amount of hot water flowing through the pipes at all times. This process will dramatically reduce the time it takes for your water to warm up. One of the great things about a hot water circulation pump is that it is eco-friendly. You will use significantly less water because you will not need to have your shower running for an extended period of time for the water to heat up. If you get an advanced system, the pump will sit at the water heater. However, the control valve will be located by a fixture that experiences heavy use. The valve will allow you to control when you would like the water to reach a certain temperature. 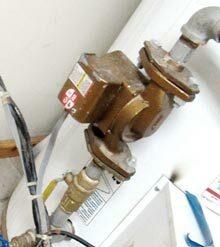 This process saves homeowners energy and money because they are not heating up water when it is not needed. If you are tired of wasting water or running out of hot water, then you should install a hot water circulation pump in your home. The installation is quick and easy as long as you use the services of a professional plumber. Contact a plumber in NYC for your new hot water circulation pump.